I’m really happy I had a chance to interview Patterns by Figgy’s and they also graciously offered up some patterns for a giveaway as well! Read on for the interview and giveaway. How did Patterns by Figgy’s get started? Figgy’s got started from a simple idea that came from frustration. I know that sounds terrible doesn’t it? In 2008 I decided to take my sewing to another level by opening a little Etsy shop so I could stay at home but still help pay the bills. I frequented a wonderful fabric shop (“Sew to Speak” in Ohio) that carried adorable children’s patterns. The only issue was I could never use them to help create garments for my shop. So I began drafting my own patterns. In 2009 I met a fabulous designer through Flickr, Karen LePage. She was not only a great designer but she was also a graphic designer and that’s what I needed. She took my pencil drawings and made them “pretty” (keeping it simple, it takes a lot more work than you think). As I got to know her more and more and realized how well we work together I quickly asked her to become my business partner. Thank goodness Karen said “yes”. Because of our teamwork Karen and I became an official company in 2010. The best part is that we shared a very important belief, which is that we wanted the seamsters that purchased our patterns to use them and create garments to sell at farmers markets and online venues. Where can we buy quality knits? I always suggest checking the locally owned fabric shops and talk to the shop owner about what you’re looking for and perhaps they’ll have just what you need. If that’s not possible a few terrific online outlets are: “HARTS Fabric” has terrific fashion apparel knits and “Sew Mama Sew” always has a nice selection. Do I need to have a serger? There’s nothing like having a serger around the house. Cuts a lot of my time in half when constructing garments but if you’re not sewing five garments a day then your sewing machine will do the trick. It’s as simple as changing your stitch to a zig zag stitch, change the width to 1.0 and the length to 3.0. There are some terrific knit tutorials out on the web if you prefer to have a visual guide. We just added a new one to our blog that was part of the “Great Knit Experience” that Jen from “Stitch Simple” began last week. 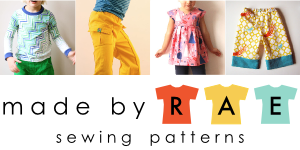 I know I hinted at patterns for adults, and you do have a larger sizing of the tee for two pattern for kids that fits adult s/m, but are there any other plans in the works? By popular demand we have also released the “Little Woo” in teen and Small/Medium adult sizes “(Big) Little Woo”. We’ve had some requests for the “Ofelia” pattern to be sized for teens/adults so that’s something we’re taking into consideration. What’s in store for your next pattern collection this spring? The Spring line is my very favorite line since we began the business. We have a total of 3 patterns with a total of 6 garments coming out in May to be introduced at or a little before Quilt Market this coming Spring in Salt Lake City. We are offering both boy and girl patterns that have a vintage feel but with a modern twist. We are working with an amazing fabric designer “Happy Zombie” who is with the Lecien fabric company. I wish I could share more and I will, just as soon as we can! We’ll also have a big announcement in regards the book we just finished for Wiley publishing next month. At that time we’ll actually get to tell everyone what it’s about! Thanks Shelly and Karen! I’m really excited about all your upcoming business adventures, should be fun to see what’s to come! There will be 3 winners selected to each win their choice of a Patterns by Figgy’s pattern! How fun is that?! Just started making clothes so I am very very new at this but the patterns look easy enough! I’ve never tried their patterns, but they sure look cute! I just recently learned about Figgy’s . . . very cute! I love the Robert Kaufman fabrics. Thanks for this opportunity. I just got a serger for Christmas and am DYING to work on some knits! These patterns are amazing! Thanks for such an informative interview and great giveaway! I’ve purchased some knits, my mom bought me a serger, and I’ve yet to make anything! Thanks for the inspiration. I have a serger but haven’t done much with it but would love to start sewing knits! I just found your blog not too long ago and have secretly stalked it. I love it though. I would love to pick a pattern! I’d love to try one of their patterns! I would love the tee for two pattern 🙂 I can see so many possibilities! Super exciting! I love knits too!! Little Woo is Adorable! I would totally wear an adult version too! 🙂 ahibbie at gmail dot com. I’m so excited to learn about Figgy’s! And I can’t wait to check out the first fabric source link. I am still gun shy with knits…perhaps this is the kick I need! Very excited to learn about the adult sizing on some patterns! Thanks for hosting the giveaway! Ooooh – I was JUST looking at the tee for two pattern for my first foray into knits! The dress is so cute and could be embellished in so many ways, love it! Sign me up for this giveaway STAT! What I think is the best part is that they allow people to make and sell garments made from their patterns. Because not all of us have the ability or desire to draft our own patterns. Thanks for the chance to win a pattern. I have some knits laying around that need to be made into something. Thanks for the chance to win. oh goodness! too fun! fingers crossed! I just got a serger for Christmas and my 4 year old could sure use some new clothing. I am loving the Dapper Dillingers! They look so comfortable! Ohh I looove their patterns, I have a little woo and want more!!! Cute pattern! If I win I will have to try my hand at sewing with knits(scary!). Patterns by Patterns by Figgy have been on my list to buy for a while now. I love that they have patterns for boys! I’m still scared of knits. Love that Tee for Two pattern – thanks for the lovely interview and give away! I have been to Sew to Speak, love it!!! Would love to win a pattern!!! What a great post! I really want to try making clothing…it seems so scary! This would give me the push I need, thanks! I’ve been dying to try the Tea for Two pattern!! If I don’t win, I may just have to break down and buy it! How awesome…I didn’t even know about these great patterns! I would love to win a pattern. I have two nieces and a nephew that would look cute in any of them! I’ve loved these patterns for a bit. . . thanks for the chance to dip my feet back into knits. What a wonderful story and so inspirational! These pattern are super cute! I hope I win! pick me! pick me! Ooh, awesome, I’d love to win! I just purchased the Tee for Two pattern but have yet to actually make it (sigh). Also just recently got a very basic model serger. I’m primed and ready to sew for my two awesome kiddos! Thanks for the chance at such a great giveaway! Sounds fun! I have no fear of knits, although they might fear me!! Great giveaway! I can’t wait to try one of these patterns. Oooh, I have the Tee for Two, and my Little Woo just arrived in the mail today! Can’t wait to get started. Thanks for the chance to win! Another great place to get knit fabric for small projects (i.e. kid clothes) is the clearance section in women’s clothing. You can get a large or extra large shirt that is about a yard of material for under $5. Someday, I’d like a serger. But if I win the giveaway my trust old White sewing machine will have to do. very fun! and an inspiration, if you can dream it…it can happen! Yay! Thanks for the giveaway! I have, thusfar, been a little (lot) afraid of patterns, but I’ve heard such great things about Figgy’s patterns and would love to give them a shot. thanks for sharing a new pattern resource, and for the chance to win. I have been thinking about trying one of these patterns out for weeks now. Thanks for the chance to win! I am slowly starting to work with knots and would love to win! Woo hoo!! Their patterns are adorable!!! I would love one! I’ve been eyeing the beech hoodie pattern for a while. I love your patterns! Especially the thicker paper. Beach Bum hoodie is awesome! Thanks for a chance to win a freebie! Fabulous giveaway, would love some of their patterns. I would love the chance to win one of their patterns! Still waiting for the perfect pattern to start sewing knits… could this be it? I think so! I love to sew knits and I have two boys that are constantly growing out of their clothes — I’d love to win! jenny and sullivan and parker at comcast dot net. I would love to win the tea for two pattern! I want to get better at sewing with knits. I haven’t worked with knits, but I am willing to try! Would love to win a pattern! Love the pattern, pick me pick me! I would love to try the tee for two pattern! I just got the Big little woo. can’t wait to try it out. There’s a few more I’d like to try out too. I’m hoping to sew more with knits this year. I’m sure a new pattern from Figgys would motivate me more. This is so helpful. I’ll have to check out those patterns! Thanks for the knit sewing tips! I would love to tackle sewing with knits–I have never done it but it is on my never ending sewing to do list. 😉 Thank you for offering a great giveaway. I have a few knits I picked up on sale, but am a little scared to start sewing with them. I am just getting restarted sewing after about 10 years! I would LOVE to win this!!!! Ooh, I already follow their blog and have been eying (that looks weird) the Tee for Two pattern. That would be a lovely winter pick me up! I am SO ready to try that tee for two pattern! I wish I had a serger, though…buuuut, no space in this house, ha! I am a novice at sewing, so having a fun pattern would be AWESOME. Thanks for a great giveaway. It would be so fun to win one of these! I just got a serger for Christmas and would love to try and make some cute clothes for my kids! I would love to work more with knits! Thanks for the giveaway! Thanks for the advice on what to do without a serger! Great interview! Thanks for the advice for those without a serger–I think I’m ready to try those knits!! The patterns are great! Hope I win!! I dream of the day I can get a serger. I guess until then it is zigzag for me. A free pattern would be awesome! Charming patterns and great advice! I love sewing for my granddaughter and am always looking for something fun to make! My new serger and I would love to have one those patterns to make something for my granddaughter! Thanks for the opportunity. Love these patterns! love these patterns and love your blog! so great. Shelly is just the best. I have the pleasure of seeing her at least once a month…yet, I don’t have a pattern! WHAT? So, sign me up! I’d love to win one of her awesome patterns! One of my sewing goals for this year is to learn to sew with knits. This would be great. What fun! Loved the interview. I’m new to sewing and haven’t gotten a chance to try out knits yet. I’ll be honest…I’m a little afraid. But I got a couple yards of knit on clearance for REALLY cheap recently (meaning I’m not afraid to waste a lot of money if I totally mess it up), so I’d love one of Figgy’s patterns to give knits a try with! How awesome! I’ve been nervous about trying knits, but this cute pattern might finally push me to go ahead and give it a shot! I would love to win a pattern – I’m ready to try out my serger on knits! Pattern’s by Figgy are my absolute favorite! They totally banished my fear of knits! Ooohhh! I’ve never seen this company and now I NEED a pattern from them!! Hope I win! Ooooh. I am saving up for a serger, and some Figgy’s patterns would be a great addition to the must-have list…. I’ve eyed their patterns for a while, but knits scare me! I got a serger from santa, so maybe with a little push and a pattern, I’ll be able to create something adorable for my kids! I would love some of these patterns! I have a pile of interlock just waiting for me to do something with it! I just tried knits for the first time, and I would love to do more! I love how the company was created to help people who choose to sew for a living! Serger is gathering dust would love a reason to bring it out again. how exciting! this is really great! I love Pattern by Figgy’s. I have begun sewing my children’s cloths and have been wanting to purchase these patterns. Thank you for the give away. Wow, It’s great having patterns for knits, especially for children. I have just discovered and started drooling over these patterns! I’d love to try out one of these patterns, and, Karen, you’ve inspired me to try to tackle knits on my regular ol’ machine. I read your tutorial, and I’m ready to give it a whirl! such a useful interview- thank you Anna, I have never been able to master sewing knits but there are lots of tips here, bookmarked it! Wow, would love to win a pattern! I love my overlocker but I really should use it more! I love knits and never seem to find good knit-patterns. I’m in! Nice to see some fashionable patterns for BOYS!!! I’m diving into making clothes for my daughter now and one of this patterns would be great to have. Thanks for the chance! I’ve been wanting to try knit fabric for a long time but I’m too scared to try. oh I would love to win a Figgy’s pattern :)thanks for the chance. I’ve looked at all the lovely Figgy patterns before, and now that I have a serger(birthday present!) I’d love the chance to win a pattern. thank you for the chance, Figgy’s patterns are adorable! little woo is my favorite! I have had a serger for years and didnt do much with it. In March, I am going to take a serger class to be able to really use my serger! Great patterns, thanks for the chance to win. These patterns are great! Really unique. I would love to win one and try it out. I’ve just been starting to delve into knits. This pattern would be awesome!! I tried one tee for my daughter, but couldn’t stand the pattern, so I gave up – but now I have a serger that does coverstitching, so it would be a perfect time to try again with an awesome new pattern! That would be awesome to win! sarahgreeneye (at)yahoo (dot) com. Here is my comment… it is just one comment… I would love to win this pattern… I love making new things! O how great this would be! What cute patterns. I am always looking for a cute pattern. when i saw the knit dress you made the other day, i was wondering if i could make it in a larger size; it’s so cool to see that a teen/small adult is becoming available! I have been shopping around for just the right pattern to make my very first garment — this is perfect! I adore that you make larger sizes since so many people do not. My older kids are always left out and have to do with scarves and hats. Can’t wait to hear about the book! I have never sewen with Knits but would love to give it a try! I just started sewing with knits! I’ve been using old t-shirts for projects, I’m practicing! I found that the key is to use my iron with lots of water and steam to make the finished project look good! I have four little people and would love a dependable tee pattern! I “splurged” on the Tee for Two” pattern and it was worth every single penny – so far this winter I have made two shirts for my son, a shirt for my daughter, and two nightgowns for her too. I even fooled around with it a little and enlarged it to make a shirt for me! I am planning to make summer shirts and dresses soon too. So versatile!!! And so adorable too! I’d love to try another pattern. lesliegrossman at yahoo dot com. ooohh…I’ve been eyeing some Figgy patterns for a while…LOVE that she has ones for boys too!! Oh wow, 187 comments already! I’ve just recently *christmas time* begun my love affair with knits, I’m totally pumped to try one of these patterns! I just started working with knits. It took a long time to get over the “fear”, but I’m so glad I did. I upcycled t-shirts and other knit clothing I had on hand. This made the fear factor less because if I really messed up or it didn’t look good, I wasn’t out a lot of money. I would love to try the Tea for Two pattern. It is just adorable! really cute patterns! i would love to try one. thanks for another fun giveaway. I’ve never sewn with knits–other than an applique on a tee. Would love to win! Thanks for the giveaway! With a grandchild on the way, I’ve been looking at kid’s patterns. I have to say, I love Figgy’s patterns, and would love to win one! ddechurc at indiana dot edu. I’ve never sewn with knits before (they scare me a little), but I’ve always loved Figgy’s patterns! I’m expecting my first baby in October and would love to sew some adorable clothes. I love having new sewing adventures. This would be a great one!! I would love the tee for two pattern for my daughters. So awesome! i would love one of these patterns! What a great story! I would love to win one of their patterns! I hope to win that Nie Nie skirt pattern to make up for my 7-year-old granddaughter ! These are great! Thanks for introducing such a great resource! OH! I’d love to win the tee for two pattern! Thanks for the inspiration! I think I’m ready to try sewing with knits. Would love to try one of their patterns for my first experience with knits! I used to sew knits about 10 years ago, but then I stopped. I’m getting inspired to start again! Thanks! I have a serger and have just started sewing knits. I’d love to try out some Figgy’s patterns!! I haven’t ventured into the wonderful world of knits yet (I’m too scared!) so this will be the push I needed! I’ve never made anything with knits, but I would love to try! My sister has a serger, but i think my sewing machine can do it too! Oh I have been dying to try that Tee for Two pattern!!! I’d love to try a pattern! I’m looking forward to the book too. I have been eyeing the Tee for Two pattern for a while now. I’m excited to see new patterns by Figgy’s! What a fun giveaway – I have to sew almost all of my 8 mo old daughter’s clothes since she’s about 2T size and wears cloth diapers. I would love to try one of their patterns. Thanks for the chance to win! I own the “tee for two” pattern, and would love to win the larger sized “little woo”. I’m dying to try that one out! Thank you so much for offering larger sizes. I would love to win a Figgy pattern! I just got a serger for christmas and would love to win one of these. This would be so so fun to try! I’m looking forward to seeing her spring patterns! They sound great. Oh, knits. How I love you, how I use inappropriate language when I sew you… A pattern might help a lot! I’d like to win such a beautiful pattern! I have done a few knits before, but they still give me the nervous tummy! Nice interview! I’ve been wanting to sew more with knits, so it’s great to have resources like this. Thanks! How fun! I would love to win but I may just buy some of these patterns anyway. How have I not heard of this company before? I’ve been wanting to attempt sewing with knits with my serger…and I would love to try one of these patterns! Awesome. Nice interview. Thanks for the giveaway. Here’s one I just HAVE to win. I´d love to win…my moms birthday is on friday, hopefully that means I am lucky…lucky to have her anyway. thanks for the giveaway! We are learning how to fit and sew knits at our ASG meetings right now. I would love more patterns! I have been wanting to try one of their patterns! Would love to win one! love the patterns and would love the chance to try one out. Thanks for the chance, this is a wonderful giveaway! I’m a pretty new sewer and have experimented with knits a bit, but would love to get my hands on some Figgy!!! !Thanks for sharing this! Would you believe I have a serger that I don’t use? Criminal, I know. I need to break it back in again. I’d love to start out with a pattern from Patterns by Figgy! Would love to try the patterns! How awesome to have patterns that we can use to create items for our shop!! Thank you Figgy!!! They are really cute!! I have been dying to try the “Tee for Two” pattern. Love this shop! I’d love hearing peoples stories on how they started. Trying to get started myself! Fantastic! I could really use some tips for working with knit — Thanks! I would certainly love a chance. I’ve been apprehensive about working with knits but reading your posts lately have given me a bit of encouragement. I would love any of these patterns! I love the Tee for Two pattern because it can be used as a top and dress. So cute and perfect for working on my serger that I just got. How exciting!! Which one would I choose?? Tough question. Thanks for the opportunity! I need to get my sewing mojo back.. a new pattern would be just the thing! I’ve had a serger for years, and just got brave enough to use it last fall – LOVE it. Now I have some knit to use, but a pattern would be wonderful… it would surely make the project more successful! What a great giveaway! I don’t have a serger … yet … I’m still dreaming of one. I wil be so excited to try the pattern that i am going to win, my serger is screaming for something fun. my daughter is so into comfy clothes – these look perfect! Very fun! Its great to hear their business story. I want to do more sewing garments (and learn how to sew knits) this year, so this would be great! I’m really into trying out new, indy pattern designers, so I’m crossing my fingers I win! I am always on the look out for new patterns! I would love a chance to win some! Thanks for doing this! I recently found the Figgy website and love the patterns. I have a small grandson and some other family babies on the way and will be sewing clothes for them. I am looking forward to trying you patterns! awesome! these look like fun patterns! Love those patterns. just got a serger this month. Would love a chance to win! Thanks! This is a great giveaway! I want to be like Anna – and never be afraid of knits again! :) I have always wanted to sew with knits but have been too afraid. This post has given me the “push” to just try it. Winning one of your patterns would be great! Thanks so much for the chance! I love “Sew to Speak”. I hope to win the patterns to use there great fabric! Thanks for the giveaway! I haven’t heard of patterns by Figgy but would love to give them a try. Thanks! Knits are so great since they are so comfy, I would love to win a patten. That tee for two one looks super!! I have heard such great things about their patterns and have been looking for the perfect basic tee pattern! Hope I win! Thanks for the giveaway and the info! I was just in SF and bought the most lovely, high quality knit remnants in following my personal pledge to become more confident in sewing with knits this year. I love Figgy’s patterns and would love a chance to win. Loved your recent Tee for Two post. Happy to have a chance at winning some great knit patterns. Figgy’s is now on my to-do list! Thanks! my 2 4yo boys are long & lean… so off the rack clothes don’t do too well for them. a cute, well-designed pattern would be fantastic help! loved browsing the website – like Kenda said, a lot of helpful tips. I have been tempted to try my hand at garment sewing. I love that you can sell what you make from these patterns! What a great business philosophy! Love it! I need to work more with knits. I would LOVE to try one of your patterns! My mom & I have been sewing for years and I have just now started sewing on my own for my 2 year old daughter and a little bit for my son. YAY for new things!! Thanks so much! Wow! With 7 grandkids, I think I NEED this pattern! Thanks for the generousity! love those patterns! so cute! I would love to have a pattern for my granddaughters. I love to sew with knits. What cute patterns! I’m pretty new to working with knits but I’d love to win a pattern and give it a try. I’ve been waiting for a good time to jump into knits…this may be it. I love these patterns! I have been making the t-shirts and dapper dillinger pants for my boys. They look so handsome in them. I would love to win and try out a new pattern. Wow! I love this pattern line! Nice patterns. Thanks a lot for the giveaway! Great interview and the patterns look great too. I know it might not be the best choice but, last Fall I did run across some fairly nice selection of knits at Hancocks Fabrics. I’ve been wanting to try the Tee for Two pattern! It looks so good on little boys. Such a cute tee pattern! I’d love to try their patterns out for my kiddos. I’d like to try this out– my children are so little, it doesn’t seem worth it to put them in anything that doesn’t stretch and isn’t totally comfortable. Adore the Little Woo pattern…is the adult size pattern somewhere online? I’d love to make it for myself!! I would love to win the pattern!!! If not, I’ll buy it! I love the patterns! I have never sewed with knits, but really want to try it out. Thanks for the giveaway! I love the Tee for Two–I’ve seen it all over blogland, and I’ve been dying to try that pattern! Totally cool patterns. I would love a new pattern for my boys. I have a stash of knits just waiting for a new pattern! love the patterns! love the giveaway!! I would love to start sewing with knits – and Patterns by Figgy makes me want to do it! I can ‘see’ my daughter in all the patterns. I hope I get an opportunity to do it. i just got a serger and really need to start using it. thanks for the chance to win! i’d love the tee for two pattern. I am inspired by mini boden’s tees with mismatched sleeves and want to try to make something similar for my daughter. It’s nice to know a little history! I’m newer to knits but love them and just got my grandmas serger so these patterns would be so fun to try!!! I’ve been looking at these patterns for a while and trying to decide which to try first. Thanks for hosting the giveaway! sabrinahannah at gmail dot com. I’m so excited! I just finished my first Tee for Two and it looks so cute on my 9 month old. I LOOOVE sewing with knits(maybe even more than wovens). I have 3 kiddos (9 mth girl, 5 yr boy and 8 yr girl)and would love to win the “Tee for Two” pattern because it’s something I could use for all of them. I would be thrilled to win one of the patterns. And thanks for all your ideas on knits and fabric. I’d love to try knit dresses! Cute patterns! It’s been awhile since I’ve sewn with knits. I’d love it give it a try again. yay yay yay… lucky number 338! Oh, lovely lovely! I’ve sewn with knits a few times and found the results surprisingly satisfying! i am really excited about this post. I have had my eye on a couple of figgy patterns. love them! I’ve been wanting to try these patterns. It’s pretty late on Friday evening but I hope I’m not too late. I’d love the chance to win a pattern! i would LOVE to win a pattern!! You did a great job on the shirt!